now only inflating the package size. # Copyright (C) 1996-2014 Free Software Foundation, Inc.
# Copyright (C) 1996-2017 Free Software Foundation, Inc.
... ... @@ -20,7 +20,7 @@ You have another version of autoconf. It may work, but is not guaranteed to. # Copyright (C) 2002-2014 Free Software Foundation, Inc.
# Copyright (C) 2002-2017 Free Software Foundation, Inc.
dnl require some minimum version. Point them to the right macro. # Call AM_AUTOMAKE_VERSION and AM_AUTOMAKE_VERSION so they can be traced. # This function is AC_REQUIREd by AM_INIT_AUTOMAKE. # Copyright (C) 2001-2014 Free Software Foundation, Inc.
# Copyright (C) 2001-2017 Free Software Foundation, Inc.
# Copyright (C) 1997-2014 Free Software Foundation, Inc.
# Copyright (C) 1997-2017 Free Software Foundation, Inc.
# Copyright (C) 1999-2014 Free Software Foundation, Inc.
# Copyright (C) 1999-2017 Free Software Foundation, Inc.
# Copyright (C) 2003-2014 Free Software Foundation, Inc.
# Copyright (C) 2003-2017 Free Software Foundation, Inc.
# Copyright (C) 2009-2014 Free Software Foundation, Inc.
# Copyright (C) 2009-2017 Free Software Foundation, Inc.
# Copyright (C) 2006-2014 Free Software Foundation, Inc.
# Copyright (C) 2006-2017 Free Software Foundation, Inc.
# Copyright (C) 2004-2014 Free Software Foundation, Inc.
# Copyright (C) 2004-2017 Free Software Foundation, Inc.
# Copyright (C) 2008-2014 Free Software Foundation, Inc.
# Copyright (C) 2008-2017 Free Software Foundation, Inc.
/* Define if the GNU dcgettext() function is already present or preinstalled. diagonal. 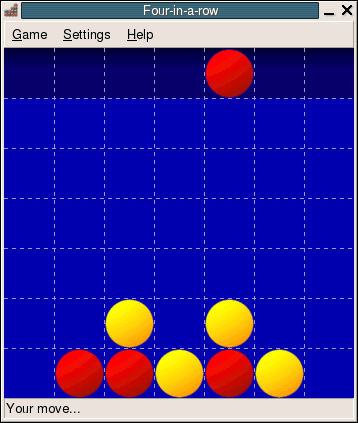 The first player to connect four in a row is the winner! you can always ask for a hint. # Translators: Do NOT translate or transliterate this text (this is an icon file name)! # Translators: Search terms to find this application. Do NOT translate or localize the semicolons! The list MUST also end with a semicolon! # Polish translation for four-in-a-row help. # Copyright © 2017 the four-in-a-row authors. # This file is distributed under the same license as the four-in-a-row package. # This file is distributed under the same license as the four-in-a-row help. # that nobody tries to guess the $tmpdir name. # Increment this whenever this file is changed. dnl Copyright (C) 2000-2002, 2007-2014, 2016 Free Software Foundation, Inc.
dnl with or without modifications, as long as this notice is preserved. dnl those with the standalone portable GNU libiconv installed). dnl AC_LINK_IFELSE will then fail, the second AC_LINK_IFELSE will succeed. am_cv_func_iconv="no, consider installing GNU libiconv"